Let’s face it, the crossover segment isn’t going anywhere anytime soon. The last 15 or so years have been a testament to drivers’ preference of the crossover as a preferred vehicle style. What’s not to love? Crossovers bring everything people like about SUVs – their higher ground clearance, better all-weather handling and spacious interiors – and combine them with the handling and urban-ready agility of a smaller sedan. To put it simply, crossovers do pretty much everything well! The class has, predictably, become crowded with every company throwing their weight behind a similarly-shaped vehicle that promises many of the same strengths. One thing they’ve all missed though is fun. The 2018 Mazda CX-5 offers a bold new attitude toward the tired class of small crossovers. Expensive luxury-styled exterior design, capable performance numbers and “give more than it takes” mentality about features are all secondary to the Mazda CX-5’s core strength – it’s a really fun to drive crossover. Test-Drive the 2018 Mazda CX-5 in Wilson, NC Today! With seating for five, available I-ACTIV AWD® and expansive feature sets standard at every trim level, the 2018 Mazda CX-5 is in its own class. The first thing you’ll notice about the 2018 Mazda CX-5 is its bold exterior design. Refusing to settle for anything less than “cool,” the exterior design crafted by Mazda seeks to stand among the “luxury badges” offered by its competitors. The crafted design of the 2018 Mazda CX-5 gives it a large front grille and fascia that seem to hungrily devour the road in front of it. Which is fitting, since the included SKYACTIV-G® engine will allow you to feel more power than ever before from a small crossover. The renowned SKYACTIV®-Drive 6-speed automatic transmission with Traction Control (TCS) and G-Vectoring Control add an uncommon degree of sportiness to the sophisticated Mazda CX-5. Inside, you’ll find even more class and composure. The 2018 Mazda CX-5 is in the business of proving that beauty is more than skin deep. Soft-touch materials and a horizontally-stretched dashboard feel upscale and expensive. The base, Sport, model doesn’t get passed over for excellent and useful interior features. A 7-inch full-color touchscreen display with multi-function commander control makes sure your media is always just a touch away. 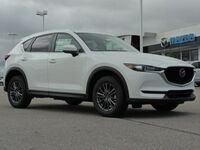 Standard leather-wrapped steering wheel and shift knob are new for 2018, while a push-button start and MAZDA-CONNECT™ infotainment push the 2018 Mazda CX-5 past base trim level expectations. Enjoy crystal-clear audio that envelopes you and your passengers with the available Bose® 10-speaker audio sound system with Centerpoint®2 and AudioPilot®2. The available head-up display gives you all the information you need it without needless distraction. Safety is at a premium in the 2018 Mazda CX-5 also. A rearview camera is standard as are advanced dual front airbags and smart city brake support. New for 2018, the Mazda CX-5 also includes Blind Spot Monitoring and Rear Cross Traffic Alert as a standard feature at all trim levels. The 2018 Mazda CX-5 takes power, comfort and convenience and mixes them together to produce the most fun you’ll have driving a small crossover. For more information on the 2018 Mazda CX-5, or to schedule a test drive, contact Medlin Mazda today!